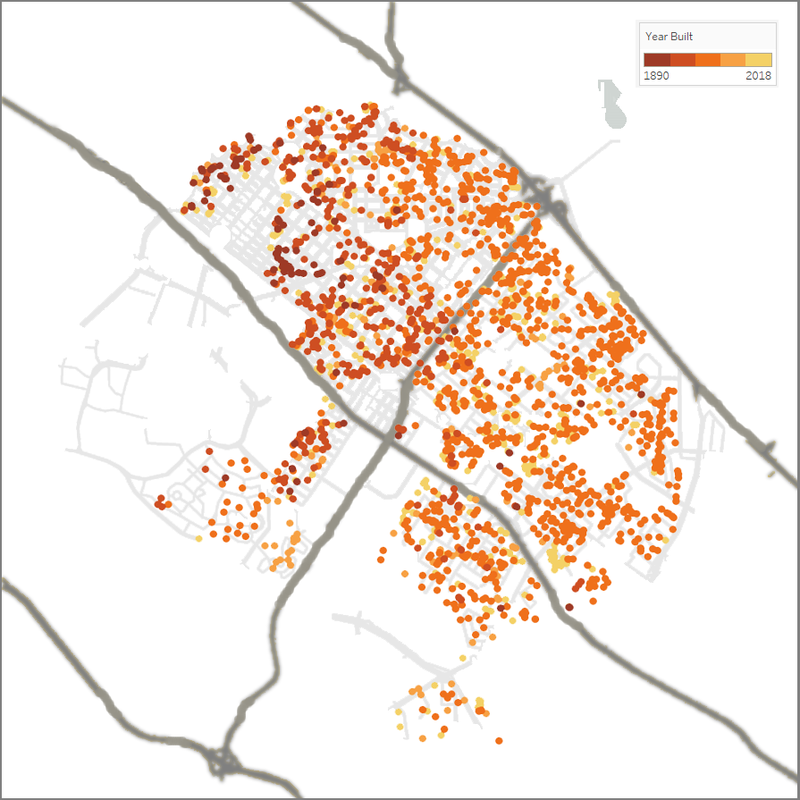 Maps are great for getting around, but are they useful for visualizing property data? We think so! Let’s aggregate over 5 years and over 2,000 sales, splash some color around, and visualize the information across latitude and longitude. The major traffic arteries criss-cross the city. What are the areas that will appear improbably blank in the maps to follow? Our two downtowns and Stanford, where single-family homes are not a normal thing. Where are the biggest sales happening in Palo Alto? What is the ratio of these larger deals to starter houses, and what neighborhoods are they all happening in? Let’s graph all the sales for the past 5 years by the Sale Price. The red (-hot) dots above indicate homes that sold for *more than* $10,000,000. The light dots ($595,000 – 1.8 million) certainly seem more affordable… until we realize that some of these properties are tear-downs! Old Palo Alto and Crescent Park appear to have the highest prevalence of our city’s most expensive homes. Ah, now the story is a bit more nuanced. A lot of the most expensive house are just a lot of house on a large lot (as Palo Alto houses are often built close to the maximum lot coverage ratio, these two often go together). Most houses in Palo Alto are selling for between $1000 and $2000 per square foot of structure. That’s still a wide band, but it does reflect almost all home sales in Palo Alto. What if you want a big place? Where are the largest lots in the city? Want 20,000 square feet of lot or more? Then you will want to look at the green-dot areas above. Palo Alto Hills and some of Stanford now join Old Palo Alto and Crescent Parkas the home of the biggest. One thing to note is that a lot of the creek-side lots bordering Menlo Park and East Palo Alto look bigger than they feel, as the land is not as usable as Old Palo Alto and Midtown. We do see some slight geographical clustering in Old Palo Alto and Crescent Park, where the audience for a high-end property may be rarer and thus slower. However there are a lot more red dots basically everywhere. Some houses are especially unique, and a longer time on market may be part of the right strategy for the seller. But some may have been overpriced in the first place, leading to one or more price reductions until sellers found the property to be a good deal. Perhaps south Palo Alto moves faster than north, but properties that “just don’t go fast” are actually everywhere. Where are the really old houses in our fair city? The oldest properties really ring the University Avenue downtown, with “age” seeming to radiate out from there. This makes sense given Palo Alto’s history as an outgrowth of Stanford. Keep in mind that many of these oldest houses are in a tear-down state, so the post-sale house may end up being effectively new; a house built in 1890 has more than done its service to the community! Data visualization is powerful, but must be taken with a grain of salt. Most transactions have a story about the exceptions that make the raw data only somewhat representative of a greater truth. However, when over 2,000 sales over 5 years are viewed all together, some patterns do certainly emerge. The data in this analysis is actual sales of 2,062 Single Family Residences in Palo Alto over the past 5+ years, from Jan 1, 2013 to July 29, 2018. It reflects publicly available MLS data, and excludes off-market transactions and certain regions of Palo Alto Hills. 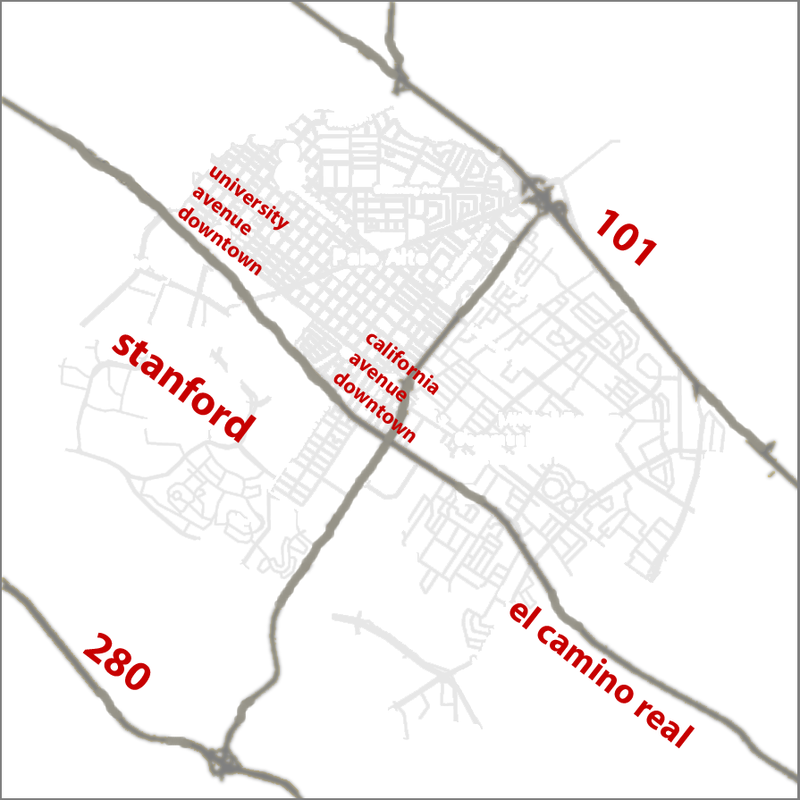 Stanford is included because it fits conveniently on these maps and because we love Stanford. The specific locations should be treated as generally accurate, but some pixel misalignment may have occurred in the graphical merge with map data. The Young Platinum Group can walk any individual client through a specific “zoomed-in & accurate” interactive version of this map with comprehensive data annotations and more detailed insights.